Relax on the quiet side of Wisconsin Dells in South Central Wisconsin's Driftless Area. Driftless Crossing at Tamarack Resort Terrace 1B is a family-owned, affordable, tranquil condo located less than 1 mile south of I-90/94 Lake Delton Exit 89, insulated by Mirror Lake State Park from all the hustle and bustle of Wisconsin Dells and ideally located next to Tamarack Resort's Hummingbird Lake—a fishing pond and home to resident ducks, geese, and other wildlife. Driftless Crossing has been enjoyed by families, couples, and friends over the years. 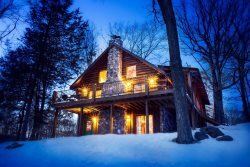 You’ll be delighted by the comfortable, updated accommodations, resort amenities, and genuine hospitality provided by the staff at Sand County Vacation Rentals. Marci is fantastic! Always a pleasure to work with. We love Sand County. This is our third time - different place every time and never have been disappointed. Check in was great, very nice, helpful man. When I called prior to the visit with a question, was answered immediately. I emailed a question when the team advised me of the pool maintenance - immediate response. When we called after we were home to say we forgot the prescription eyeglasses, the staff called back - said they found the and will mail them - That is awesome!! Property was very clean and nice - fireplace, grill, 2 baths; quite neighborhood. Very relaxing! Josh was very nice and friendly, and able to accommodate us with extra coupons for our attractions considering the weather wasn't very cooperative, but with his help we managed to have some fun. As always, we have enjoyed dealing with your team. They are professional, friendly and helpful. We enjoyed our stay very much. The location is convenient and yet close by all the activities. The office workers went of their way to help us up grade from one bedroom to two. The staff was extremely helpful and happy. It was a pleasant time interacting with them. I always rent through Sand County every time I visit the Dells. You have the best deals on the best properties, and everything is always clean and the employees are very nice! George and Margie are fantastic greeters. Love visiting the Tamarack. The stay was fabulous as always.